If you are a telemarketer, it’s imperative to have ‘thick skin’. This industry has unfortunately been given a bad reputation in the past due to underhand sales techniques in the business to consumer industry, however, we overcome this through consistently high results and strong, moral brand values. Although it seems obvious, the best way to overcome rejection is through positivity. Remaining confident and in high spirits will allow you to carry on with the task you set out to achieve without becoming downhearted. Productivity will increase as less time will be spent dwelling on aspects that cannot be changed. It’s vital to remain positive when accepting the next call, as a negative, downbeat attitude will become apparent to the contact at the other end of the line and you will lose the sale before you have even begun. 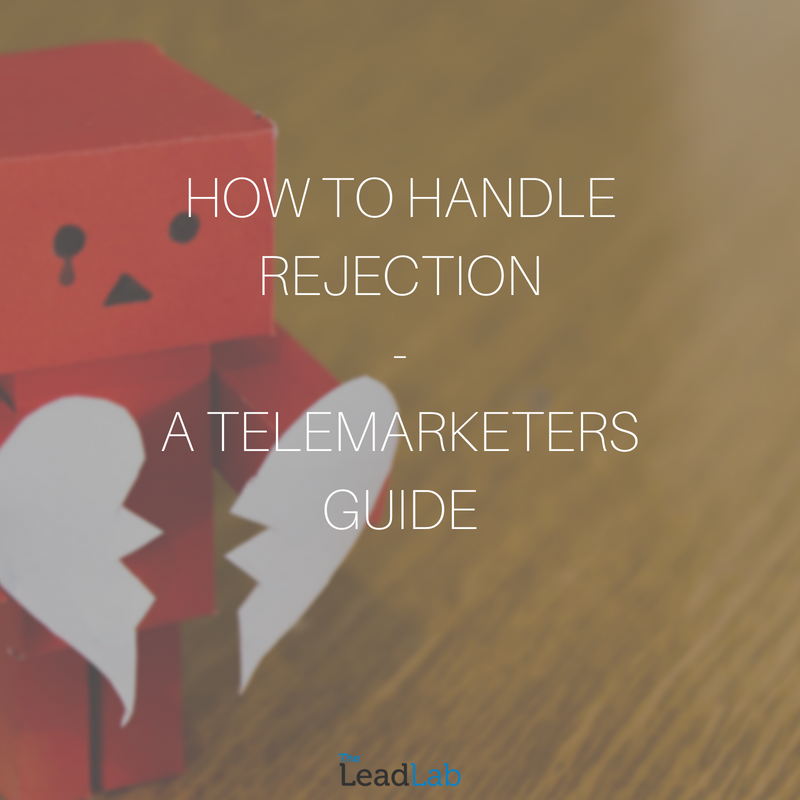 One of the most successful tips within telemarketing is to pick up the phone immediately after generating a lead, as that positive energy will pass on to the next prospect. When handling rejection, it’s important to recognise where things go wrong and consequently learn from them to prevent them from occurring again. Telemarketers can then utilise peer to peer learning, which in turn helps the whole team to improve. Sharing experiences of what has worked and what hasn’t worked will help to eliminate problems for people quickly and more efficiently, making the whole operation run more smoothly. Otherwise, the whole team would be making the same mistakes and it would take a lot longer to become experts in the industry. We hold regular team meetings at the Lead Lab, during which we listen to call recordings of both good and bad sales pitches and analyse them together. This helps everyone understand the standard to which we work to as a company, so we can continue to generate successful results. There are many occasions in telemarketing when the contact isn’t ready to buy at the specific time you call. That’s why it’s still important to get as much information across as possible; to inform them of why they do need the product you’re offering. After more consideration and discussions within their own business in the near future, they might come to the decision that they are ready to buy – and in that moment, you want to be in the forefront of their minds. This is achieved by communicating as a memorable brand and providing efficient information. Lastly, negatives must always be changed into positives. Contacts may challenge certain aspects of the product/service you’re offering, but this is the best opportunity to convert them; their outlook may seem negative, but they are giving you the chance to answer their queries and investigate whether they can benefit from the product/service on offer. If, however, they are unlikely to benefit from the offer, we end the conversation politely and proceed to the next call. Ultimately, we do not want to waste anyone’s time – our sole mission is to improve people’s businesses, whether that is our clients or the prospects we are calling.